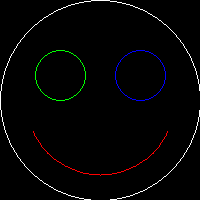 imagearc() draws an arc of circle centered at the given coordinates. The arc start angle, in degrees. The arc end angle, in degrees. 0° is located at the three-o'clock position, and the arc is drawn clockwise. A color identifier created with imagecolorallocate(). This is an example script I wrote for myself to help me learn how to used the imagearc functions. Maybe if will also help others. The imagearc function has a precision of one degree. The function truncates the $start and $end values to the inferior degree. imagearc will draw a curve from -178° to -152°. If you need accurate curves drawing, you need to use a loop to draw little step-by-step lines. By creating a large number of short enough lines, you will create the impression of a curve with accuracy. A previous for the Rotated (Filled)Ellipse note from(nojer2 at yahoo dot com, 02-Apr-2001 12:06) has a mistake, at the second arc. Replace them with the following listing. Please note that in order to draw a complete circle or ellipse (without using the imageellipse) you mustn't use 0� for both s and e. If you do this you will get, umm, nothing. Instead set s to 0� and e to 360� to get a complete circle or ellipse. This works great for circles with diameters up to about 60 or 70 pixels wide. After that, you start to get pixle gaps. imagesetstyle() sets the style to be used by all line drawing functions when drawing with the special color . Here goes a example of drawing a dashed-line circle.enjoy! Round cornered anti-aliased dynamically sized button. I didn't have much luck with the other two functions, one of them makes circles that look like they've been printed on a dot-matrix printer. This simple function builds a border out of circles, seems to work nicely. The imagearc (and imageellipse) functions do not accept line thicknesses when drawn from 0 to 360 degrees. Drawing from 0 to 359 and again from 359 to 360 does create an ellipse with the current line thickness. Here's the function to draw rotated ellipses again. This time I've optimised it a bit, fixed the no-fill bug, and used a 'squishratio' rather than a 'radiusmodifier', to make the curves perfect, so ignore my previous version. The wierd thing is that the first two integers tell where to place the "circle". So for example I first create the "pallet" to place the circle on. Places the image in the center (250,250) and the circle is 300 pixels in diameter. The params of this function is exactly the same as the usual imagearc function. Heres a function to make a curve between two points... This will be a downward curve but it wouldn't be hard to make a similar function to make an upward curve. The first point has to be to the left of the second point ($x1 < $x2), and height is actually backwards. The larger height is the less of a crest the curve has. I imagine with a few modifications this functions could make upward curves as well. ...well you get the point. It's a kludge, and *very* slow, but it's free.